As discussed in prior posts, shaft misalignment is one the major causes of premature coupling, bearing, and seal failures in a power transmission system. Even while staying within the misalignment limits of a flexible coupling, it is still advisable to keep misalignment to a minimum. A major advantage of laser alignment tools is their accuracy. Unlike some dial indicators, there is no bar sag that needs to be measured and accounted for. Readings are also very precise. 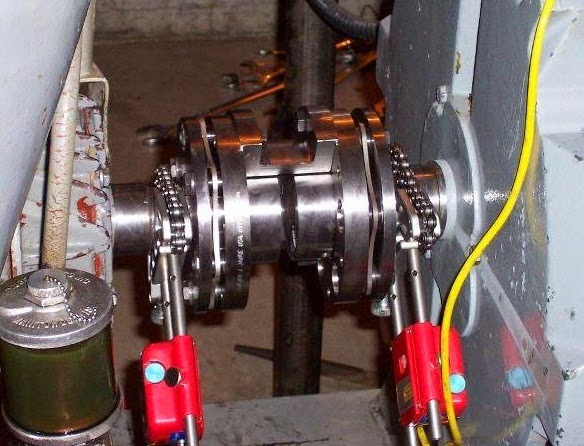 A second major advantage of most laser shaft alignment tools is that they come with a computer system that automatically calculated what adjustments are needed and records measured values (which maintenance crews can use both to verify proper installation and watch for trends or changes in equipment movement). Dial indicators generally require hand calculations and adjustments (assuming you don't use the Lovejoy Dials free new smartphone app). A third major advantage of laser alignment tools is that they can be spread fairly far apart, which is very useful when working on two sides of a long spacer type coupling. If you've got a large maintenance budget and reliability is absolutely king (any downtime means big bucks), a high quality laser alignment tool is a wonderful tool to have in the toolbox. For those currently using dial indicators without the budget to throw down on a laser alignment system, the free Lovejoy Dials app will help provide some of the automated calculation benefits of using laser tool. For those not doing shaft alignment at all, for the longevity and reliability of your equipment, we highly recommend that you start now.